GETTING AN AUTOGRAPH – A young fan gets her poster autographed by Yukon Quest musher Lisbet Norris on Wednesday during Meet the Mushers at Mount McIntyre. Before the Super Bowl, all the players and coaches have to get together for media day to answer questions from media and fans alike. The Yukon Quest is only two days away. Actually, at the time this article was written the Quest is officially two days, two hours, 58 minutes and 3 seconds away, according to the countdown tracker on the website. 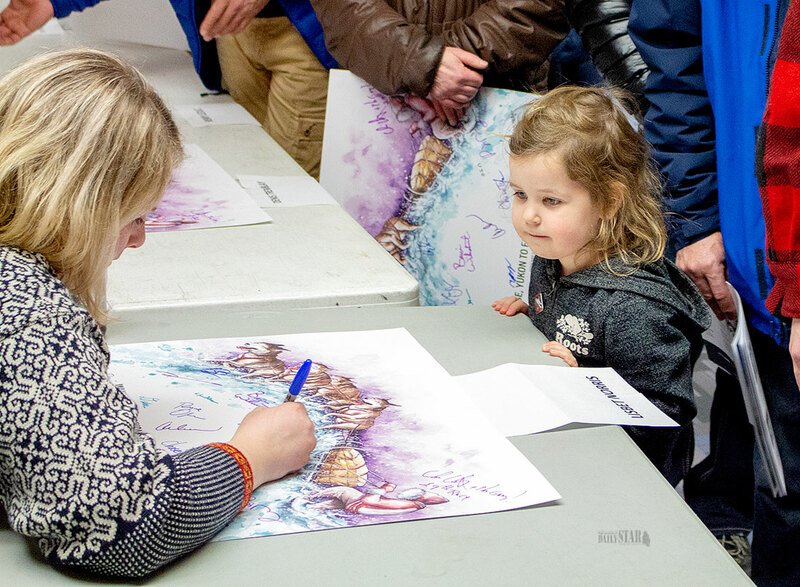 On Wednesday, fans had the opportunity to meet and get the autographs of the mushers competing in the 1,000 mile race, during the Meet the Mushers event at the Grey Room at Mount McIntyre. The snowy conditions did not stop the public from coming. Parking was at a premium and the room was packed with people all lined up to wish the mushers luck before they head out on the trail. Hans Gatt is back in the Quest after an eight-year lay off. With a smile on his face, he shook hands, signed posters and took pictures with people. No rookie to the Quest, Gatt said this is what it is all about. “Back then it was a little different,” said Gatt about the number of people who turned out. The enthusiasm people show to the race gets Gatt excited to get onto the trail. “It gets you a little hyped up,” said Gatt. Jason Biasetti, who now resides in Dawson City, is one of two rookie Canadian mushers competing in this year’s Quest. It will be his first time racing 1,000 miles and he said he has not been involved in an event like Meet the Mushers before. Biasetti was just embracing the event and said the turnout was something that surprised him. Michelle Phillips, from 10 Mile, will be doing her sixth Yukon Quest, but said doing events like Meet the Mushers don’t get old. In the Grey Room, the mushers were seated around the perimeter. The crowd slowly worked down the line making sure they had each musher’s signature and a quick chat before moving down to the next one. Phillips said it almost makes her feel like a celebrity. The people in attendance ranged in age and diversity. Yumi Matsu Moto and Miyuki travelled from Japan to experience their first Yukon Quest as well as see the Yukon as much they can. “The Yukon is great, with nice views,” said Matsu Moto and Miyuki together. Beth Troy made her way to the Yukon from South Carolina to work as a handler on the Quest for musher Olivia Webster, before heading back to Israel. The Yukon Quest mushers will figure out their start time tonight at the Start and Draw Banquet. The Quest begins Saturday at 11 a.m. at Shipyards Park in Whitehorse. The YQ300 will begin at 3 p.m. on the same date and at the same location.